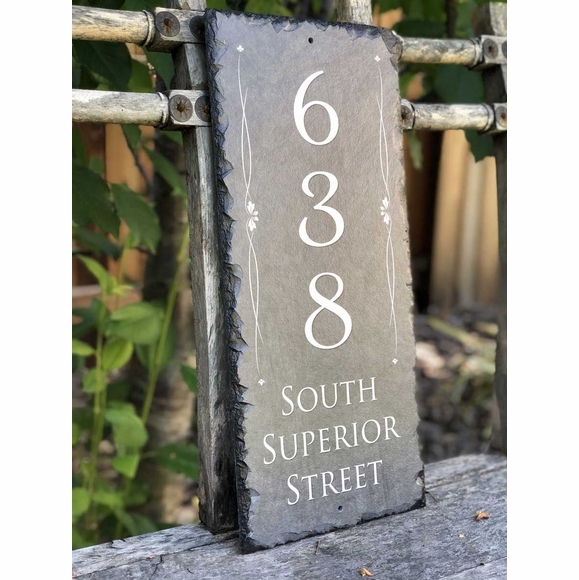 Tall House Number Plaque - - holds your house number, street name, and delicate border on both sides. Vertical orientation. Wall mount. Made in USA. Holds a house number up to six (6) digits. Lines 1 (ex: South), 2 (ex: Superior), and 3 (ex: Street) hold up to ten (10) characters each. Character count includes punctuation and spaces. If you are not using all three address lines, please leave the extra input boxes empty. Colors: charcoal gray with chalk white wording. Address number in sign: 638 SOUTH SUPERIOR STREET.